And we have a strong hint in this strange story of a moment some five hundred years later when on that first Easter morning the blackness of death dissolved into the sunrise of new life, when Jesus in resurrection glory stepped out of Joseph’s tomb. Out of defeat of an excruciating death on Good Friday came resurrection victory ... out of despair came a living hope; out of what seemed to be the end, Jesus brought a new beginning. Out of dry bones came a new body – a sign for all time of new hope, and of a new life. But those were baffling and fearful moments for the disciples and friends of Jesus on that first Easter morning and for days after. Jesus appeared first to His most intimate friends and disciples, Peter, James and John. And then He showed Himself to a small group of women who had slipped out to the tomb in the early morning hours with spices to anoint His body. Next He appeared to the rest of His disciples. They were all amazed and shocked. It was incomprehensible, dead people stay dead, but Jesus was alive! On Friday He was dead and buried, and now He was alive again. Over the next forty days Jesus appeared to friends on several different occasions. He ate with them, walked and talked with them. They were convinced He was alive. Their witness was not just that the grave was empty; rather it was that Christ Jesus was alive. This Jesus who was crucified, God had raised from the dead. He is the Son of God, and the future is in His hands. This mind bogging fact revolutionized their pattern of life. No longer were they a confused cadre of people clustered fearfully around a dead cause, rather, they were a transformed and electrified group of witnesses with a dynamic message about a risen Christ which literally exploded across the country side. Life changing miracles became common place wherever people heard the startling good-news and there began then a life-changing chain reaction which has reverberated across the intervening years into both our present and our future. 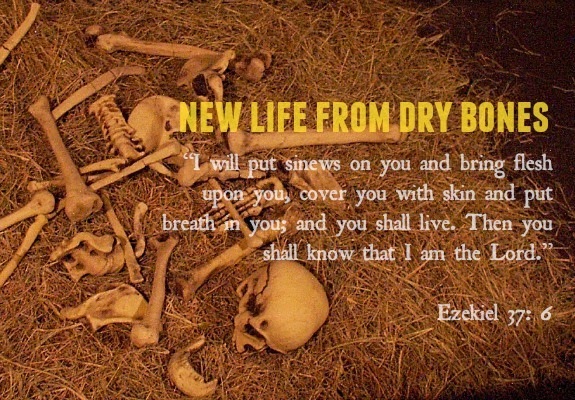 In the fulfillment of Ezekiel’s prophecy, God gives new life through Jesus Christ ... a new living Spirit to our dead bones. And it is through this awesome event and all that led up to it, and all which follows, that we can find a living and lasting and workable hope. We in Nigeria, in particular, need this hope. First, there is hope for us as people. In the words of Apostle Paul, we can do all things through Christ who strengthens us. If God can give new life to dry bones, He can breathe new life into each of us and infuse us with the energy of the Holy Spirit so that our deepest hurts are healed and our profoundest needs are met in the raw give and take life right now. And if God could breathe new life into Jesus and propel Him from the tomb on that first Easter morning, there is no mistake we can make or sin we can commit that will move us outside the redemptive grace unleashed at the moment of resurrection. And then the Easter message of hope is for this world today. We today live in a bewildered society. We listen to radio and television news and ponder the complexities of peace and war in our very country. We read of the misery and sufferings in other lands; countries and people who were once friends are now calling themselves enemies. Treachery and self-service seem to motivate so much that goes on, and through energy and gasoline shortages and high prices we feel the hostility and greed of many former friends. We find ourselves in a shrunken and troubled world, traumatized by the fear of nuclear accidents, suicide bombings, crippling inflation, political uncertainties, crime at home and hunger facing us squarely on the face. There is fear all about us, and the smell of death is in the air. But Easter and the events leading up to it remind us that God is still in control. This is His world, and He has the last word. History is rich in moments when it seemed there was no hope; there were no solutions in sight; but what seemed like the end was really the new beginning. If human memory is not that short, the Biafra- Nigeria war and all the events that surround it, point to the fact that God is in perfect control. The Cross cast a frightening shadow of doom across the frantic efforts of people everywhere, yet Resurrection brought life and hope. If God can give new life to dead bones and raise Jesus from the tomb, He can today, breathe new life into our troubled world. But He works through the dedicated efforts of His people wherever they are found. By God’s grace, you and I , if you know the Risen Jesus as your Lord and Saviour, have the potential to change the world. We can demonstrate a way of wholeness that gives our day-to-day life new meaning. We can proclaim our Easter message and work to make this world and indeed Nigeria, the kind of place that God would have it to be, with the radiant hope that, come what may, we are forever and wonderfully in the hands of God. And then the Easter message promises that physical death is not the end. God will give new flesh to our dry bones in life beyond the grave. The lessons learned, the maturity gained here and now is not lost in oblivion; rather our training here as Christians will serve us well in God’s future economy. The writer of the Book of Hebrews laid it out pretty well and hinted strongly at the promise of the future when he wrote: “Therefore we also, since we are surrounded by so great a cloud of witnesses, let us lay aside every weight, and the sin which so easily ensnares us, and let us run with endurance the race that is set before us, looking unto Jesus, the author and finisher of our faith, who for the joy that was set before Him endured the cross, despising the shame, and has sat down at the right hand of the throne of God." (Hebrews 12:1-2). The risen Lord is looking at us today as we run the race of life. Finally, for me, the greatest miracle of Easter is not just that Jesus rose from the dead, but that we can be risen with Him now. The gift of God to us is that the resurrection life of Jesus Christ can be lived out through us today and tomorrow. He is alive in us right now! Paul could say; “It is no longer I who live, but Christ who lives in me.” (Galatians 2:20) Eternal life for the Christian does not begin at death. It is ours here and now in the hurly burly of life as we live it out with our loved ones and friends and business relationships, twenty-four hours each day. If Jesus had not died, I would not have had a chance of getting into God’s Kingdom. But if you would ask me why He resurrected, I would say, “I guess that is what it took to give new life to my dry bones.” And my Easter message to all Nigerians and to each one of you reading now is that if you will let Him, God will give that same glorious new life to your dry bones! He is knocking at your door with healing and new life in His hands; would you let Him in?